Immunization with the thymus-independent (TI) Ag native dextran (DX) B512 induces germinal center (GC) formation in the spleen. However, despite this GC formation, the anti-DX response is poor, and no affinity maturation can be observed. Using cholera toxin (CT) as an adjuvant, splenic as well as humoral responses to DX are improved. In this study, we investigated immune responses against DX in mice lacking TNF receptor I and in athymic mice. The adjuvant effect of CT on these responses was also evaluated. Mice lacking the TNF receptor I allowed us to investigate the role of follicular dendritic cell networks and GC formation in the spleen for the generation of Ab responses to DX, whereas we could investigate the role of T cells in GC development to TI Ags using athymic mice. We found that the humoral immune response to TI DX B512 was not dependent upon T cells or the presence of GCs, although GC development occurred after DX immunization. However, T cells were required for this GC formation, since athymic mice could not develop GCs after immunization with DX. We also show that even if CT is able to directly activate B cells when administered as an adjuvant, the major effect may require T cell participation; this is also the case for TI Ags. In contrast, CT adjuvancy is independent of GC formation. The process of Ag-specific B cell differentiation begins in the T cell-rich periarteriolar lymphoid sheath of lymphoid tissues. After this initial activation step, in which short-lived Ab-secreting plasma cells are produced, the B cells migrate into the B cell follicles, where they interact with the follicular dendritic cells (FDCs)3 to form germinal centers (GCs). In the GCs, the B cells undergo rapid clonal expansion and somatic hypermutation of their Ig-variable genes. B cells that express high affinity for the Ag are positively selected by competition for the binding of Ag trapped in immune complexes on the FDC processes. Ag-specific CD4+ T cells that are present in the GCs provide further costimulation to the B cells. High-affinity B cells that receive proper costimulatory signals from the T cells continue to differentiate into plasma cells or memory cells, whereas B cells with low affinity for the Ag die by apoptosis (reviewed in refs. 1 and 2). The GC reaction is usually described for immune responses to thymus-dependent (TD) Ags and has been shown to be dependent upon T cells (3, 4). However, we and others have demonstrated that GC formation also occurs in response to some thymus-independent (TI) Ags (5, 6, 7, 8, 9). Despite this finding, many TI Ags, in particular type 2 TI (TI-2) Ags, are poor immunogens, because they induce mainly IgM production and do not generate any immunologic memory (reviewed in ref. 10). The immune response to TI-2 Ags is important, since many pathogenic bacteria are surrounded by carbohydrate capsules that act as TI-2 Ags (11). We studied GC formation following immunizations with a TI and a TD form of the bacterial carbohydrate dextran (DX) B512 (9). Native DX B512 is a highly repetitive molecule consisting of glucose units. It has an average m.w. of 50 × 106 and is a TI-2 Ag in this high m.w. form (12, 13). The immunogenicity of DX decreases with decreasing m.w., and DXs with a m.w. of ≤5 × 105 are not immunogenic. Conjugation of nonimmunogenic DX (low m.w.) to a protein carrier generates a conjugate that is able to evoke a TD response to DX with high IgG Ab levels and a good memory response (14). We demonstrated that primary TI and TD DX responses were indistinguishable in terms of GC formation. This finding indicated that it was not an inability to form GCs that caused the poor memory anti-DX Ab response after immunization with the TI form of DX. Although TI and TD GC formation were similar, the TI GC reaction was less efficient because there was no generation of memory in the TI response. It was possible to enhance the GC reactions to both the TI and TD form of DX using the very potent adjuvant cholera toxin (CT) (15, 16, 17) for the immunizations. In particular, the secondary GC reaction was enhanced, as reflected by increased anti-DX Ab levels (9, 18). It has been claimed that a successful GC reaction to an Ag requires the presence of T cells as well as a well-organized network of FDCs. In this study, we investigate these parameters in the immune response to DX. The importance of an intact FDC network was evaluated using mice that lack the TNF receptor I (TNFRI−/− mice) (19, 20), whereas athymic mice (21) allowed us to study the role of T cells for the generation of GCs in responses to TI Ags. Our results indicate that the GCs that develop after TI Ag immunization in normal mice are not obligatory for the generation of Ab responses. In fact, a complete absence of GC formation after immunization with the TI form of DX in the TNFRI−/− mice did not impair the humoral response. Athymic mice were able to mount a humoral response to the TI form of DX in the absence of developed GCs, showing that T cells were necessary for GC formation but not for Ab responses to TI Ags. Furthermore, we observed that CT did not exert any adjuvant effect on DX responses in athymic mice, indicating that T cells are involved in the CT-induced enhancement of the immune response to the TI form of DX. These findings in relation to differences in TI and TD Ag activation of the immune response are discussed. TNFRI−/− mice (22) were used with the kind permission of Prof. Tak Mak (Ontario Cancer Institute, Toronto, Canada) and bred in the animal facilities at the Microbiology Tumorbiology Center Karolinska Institute (Solna, Sweden). C57BL/6 nu/nu mice were obtained from Bomholtgård (Ry, Denmark), and C57BL/6 mice were obtained from Charles River (Uppsala, Sweden). All mice were maintained in our own animal facilities at Stockholm University during the experiments and were 2 to 4 mo old when used. Native DX B512 (TI Ag) with a m.w. of 5 to 40 × 106 was obtained from INC Pharmaceuticals (Cleveland, OH). A TD form of DX was obtained by conjugating DX with a m.w. of 103 (3–5 glucose units) to the protein chicken serum albumin (CSA) (Sigma, St. Louis, MO) (14). DX was conjugated to hydrazide-CSA via its terminal aldehyde group using reductive amination and was kindly provided by Dr. Christian Krog-Jensen (Department of Organic Chemistry, Stockholm University). CT was obtained from List Biological Laboratories (Campbell, CA). Mice were immunized i.p. with 10 μg of native DX or with 100 μg of CSA-DX. Both Ags were administered in soluble form or in combination with CT. CT was administered i.p. together with the different Ags; each mouse received 1 μg of CT per dose. For studies of the secondary response, animals were immunized a second time after a resting period of 4 wk. Mice were bled by retroorbital puncture under light ether anesthesia at 10 days after primary immunization and 7 days after secondary immunization. Serum was separated after centrifugation and tested by ELISA. ELISAs were performed as described previously (23). Briefly, ELISA plates (Costar, Cambridge, MA) were coated with 10 μg/ml DX T250 (Pharmacia, Uppsala, Sweden). Test sera were added in twofold dilutions starting with a 1/100 dilution. DX-specific mouse mAbs were used as positive controls for the ELISAs. 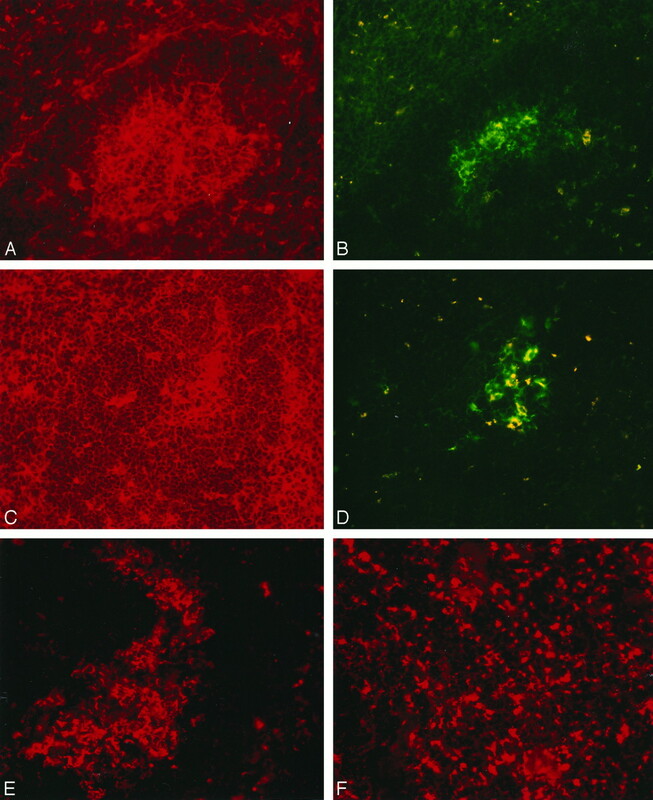 Bound Ig was detected with alkaline phosphatase-labeled goat anti-mouse IgM and IgG (Southern Biotechnology Associates, Birmingham, AL) and p-nitrophenyl phosphatase substrate (Sigma). OD values at 405 nm were determined using an Anthos Reader 2001 (Anthos Labtech Instruments, Saltzburg, Austria). Spleens were removed at 10 days after primary immunization or 7 days after secondary immunization, immediately frozen in liquid nitrogen, and stored at −70°C. Spleens were embedded in Tissue Tek OCT compound (Miles, Elkhart, IN), and cryostat sections (6 μm) were cut and mounted. The slides were air-dried for 30 to 60 min and stored at −70°C until use. Cryostat sections were fixed for 15 min in ice-cold acetone. Subsequently, slides were rinsed with PBS and blocked with horse serum (5% in PBS) for 30 min. Sections were stained with 70 kDa and 250 kDa of FITC-conjugated DX (FITC-DX) (Sigma), and biotin (bi)-conjugated peanut agglutinin (PNA) was developed with streptavidin-Texas Red (TR) conjugate (Vector Laboratories, Burlingame, CA). Protein G-purified anti-DX mAb 11-1A6 (13) was conjugated using bi-N-hydroxysuccinimide ester (Sigma). To detect T cells, sections were stained with an FITC-conjugated anti-CD3 Ab (PharMingen, San Diego, CA). The sections were incubated with biotinylated or fluoresceinated reagents as indicated for 60 min and then incubated with avidin-conjugated TR for 45 min with washings after each staining. All stainings were performed in a humidified chamber protected from light. To investigate the role of an intact splenic architecture and developed FDC clusters in the generation of an efficient immune response against a TI Ag, we immunized TNFRI−/− mice with native, TI DX and with the TD protein-DX conjugate CSA-DX. The DX preparations were administered i.p. in saline in the absence or presence of CT adjuvant. The mice were sacrificed on day 10 after primary immunizations or on day 7 after secondary immunizations, and splenic sections were prepared as described in Materials and Methods. We have shown previously that these kinetics are suitable for the investigation of splenic as well as humoral responses against DX (9, 18). GC B cells may be distinguished by their ability to bind to the lectin PNA. To identify DX-binding GC B cells, sections were costained with bi-PNA (developed with avidin-TR) and FITC-DX as described previously (7). Whereas normal mice readily developed DX-specific GCs after immunization with native DX (Fig. 1⇓, A–B), none of the TNFRI−/− mice developed GCs; this absence of GCs was evident even when DX was administered together with CT adjuvant (Fig. 1⇓C). However DX-specific B cells were present, as demonstrated by the presence of FITC-DX-binding cells in the splenic sections (Fig. 1⇓D). As in normal mice, the number of FITC-DX-positive areas was enhanced by CT, but GCs still did not develop. The cells were predominantly organized in clusters (shown), but single positive cells also could be detected in the sections. Even in the presence of CT adjuvant, immunization with the TD CSA-DX conjugate did not induce GC formation; it was also not possible to detect DX-specific B cells in these sections (data not shown). 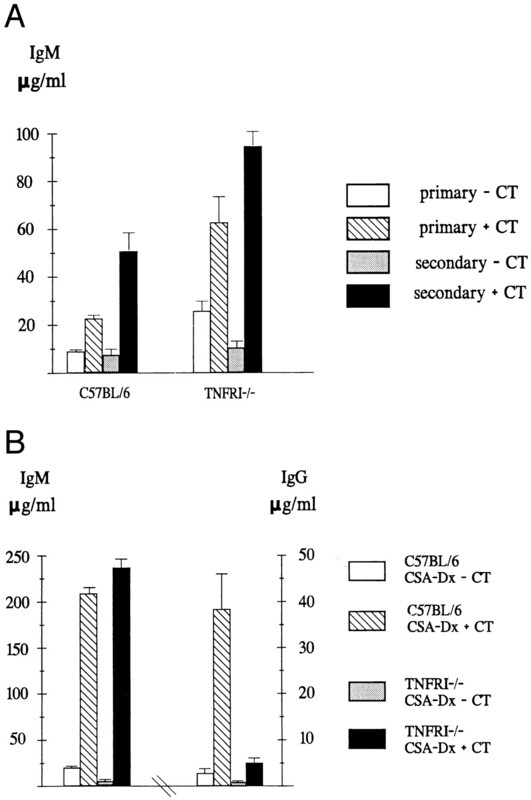 Comparison of splenic sections from C57BL/6 and TNFRI−/− mice following immunization with DX. Frozen splenic sections from TNFRI−/− and C57BL/6 mice were costained with bi-PNA (developed with avidin-TR) for the presence of GCs and with FITC-DX for the presence of Ag-specific B cells. A–B, C57BL/6 mice; C–D, TNFRI−/− mice. Costaining with bi-PNA (A) and FITC-DX (B) reveals the presence of Ag-specific GCs following secondary immunization with native DX and CT adjuvant at 7 days after secondary immunization in C57BL/6 mice. In contrast, no GC formation was observed (C) at 7 days after secondary immunization with native DX in the presence of CT adjuvant, but a clear presence of DX-specific B cells (D) in the spleens of TNFRI−/− mice was apparent at this timepoint. E–F, DX deposits in the splenic follicles after immunization with native DX. Frozen sections from C57BL/6 (E) and TNFRI−/− (F) spleens at 7 days after secondary immunizations with native DX administered together with CT adjuvant were stained with a bilabeled anti-DX Ab (revealed by avidin-TR). Results show the different distribution of DX in the spleens of the two strains. Magnification is ×32. In normal mice, large DX deposits are observed in the splenic sections following immunization with native DX. Staining with an Ab against DX reveals the presence of DX within the GC structure as well as within the marginal zone around the follicle (Fig. 1⇑E). When examining the presence of DX deposits in the TNFRI−/− mice, a completely different pattern was observed. The DX deposits were not organized in GC structures; rather, there was a dot-like staining all over the section reflecting the disturbed splenic architecture in these mice (Fig. 1⇑F). To examine whether the complete lack of GC formation had an impact on the Ab response to DX, we measured serum anti-DX Abs following primary and secondary TI and TD DX immunizations using a DX-specific ELISA. Primary Ab responses to the TI form of DX were slightly enhanced in the TNFRI−/− mice compared with normal C57BL/6 controls, whereas secondary responses were suppressed compared with the primary responses in both C57BL/6 mice and TNFRI−/− mice (Fig. 2⇓A). In normal mice, CT is able to increase secondary anti-DX Ab levels by approximately eightfold compared with the response obtained without CT. In TNFRI−/− mice, the effect of CT was more dramatic, with anti-DX Ab levels increasing 100-fold compared with the secondaryresponse generated without CT (Fig. 2⇓A). Still, as seen in normal mice, the response consisted of IgM alone. Primary and secondary Ab responses to DX are normal in TNFRI−/− mice. TNFRI−/− and C57BL/6 mice were immunized with 10 μg of native DX, 100 μg of CSA-DX in saline, or CT adjuvant. The mice were bled at 10 days after primary and 7 days after secondary immunizations, and serum samples were tested by ELISA. Data are shown as micrograms per milliliter of anti-DX IgM after challenge with native DX (A) and as micrograms per milliliter of anti-DX IgM and IgG after challenge with CSA-DX (B); note the different scales on the y-axes. The Ab responses to the TD form of DX were low in TNFRI−/− mice, with almost no IgG production. 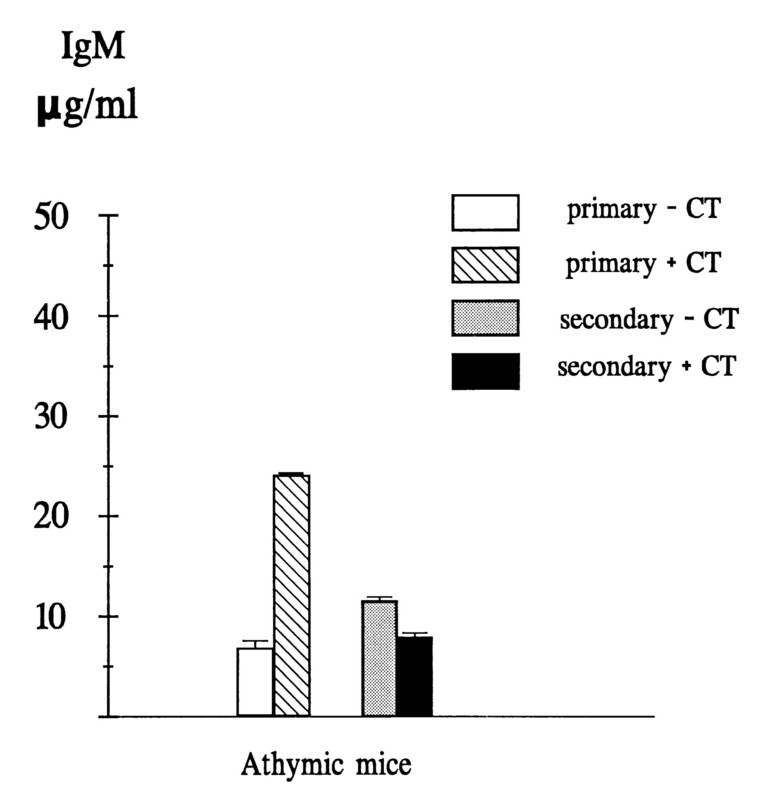 When the Ag was administered with CT adjuvant, secondary Ab responses were improved and the production of IgM was enhanced to normal levels; however, very low levels of IgG were still produced (Fig. 2⇑B). This observation shows that a well-organized FDC network and the ability to develop GCs are important for the outcome of the humoral response to the TD form of DX, whereas there is no impairment of the humoral response to TI DX despite the complete absence of organized FDC networks and GC formation. Furthermore, we show that CT can enhance humoral immune responses to both TI and TD Ags in the absence of GC formation. To investigate the role of T cells the generation of an efficient immune response to a TI Ag, we immunized athymic mice with native DX. The mice were bled and sacrificed on day 10 after primary immunizations or on day 7 after secondary immunizations, and splenic sections were prepared as described in Materials and Methods. The GC response in the athymic mice varied. Some but not all mice could develop GCs, and this development was found to correlate with the presence or absence of T cells in the sections (data not shown). Serum from athymic mice immunized with native DX was prepared as described in Materials and Methods. Primary and secondary anti-DX IgM levels were similar to the response seen in normal controls (Fig. 3⇓, compare with Fig. 2⇑A). In contrast to normal mice, CT could not enhance Ab responses in athymic mice, indicating that the adjuvant effect of CT for the TI form of DX probably is dependent upon T cells. CT has no effect on the anti-DX Ab response in athymic mice. C57BL/6 nu/nu and normal C57BL/6 mice were immunized with 10 μg of native DX in saline or with CT adjuvant. The mice were bled at 10 days after primary and 7 days after secondary immunizations, and serum samples were tested by ELISA. Data are shown as micrograms per milliliter of anti-DX IgM after challenge with native DX. In this study, we extended our previous studies on GC formation and Ab responses to a TI Ag using TNFRI−/− and athymic mice. The TNFRI−/− mice allowed us to investigate the need for well-developed FDC networks and GC formation in the spleen for the generation of immune responses to DX. Using athymic mice, we evaluated the role of T cells for a TI Ag GC response. Furthermore, in our experimental model, we investigated the requirements necessary for CT to act as an adjuvant. TNFRI−/− mice did not develop GCs in the spleen after TI Ag immunization. However, DX-specific B cells could be detected in the sections, and the humoral response was similar to normal controls. This finding suggests that although DX elicits GC formation in normal mice, humoral responses to TI Ags can occur independently of GC formation. Athymic mice did not develop GCs following DX challenge unless the mutation was leaky and CD3+ cells were present in the spleens, which indicated that T cells probably are necessary not only for TD follicular responses but also for TI Ag-induced GC development. The findings of Lahvis and Cerny (24) are in correlation with this possibility, demonstrating that up-regulation of the receptor on GC B cells binding PNA (PNA-R) is an event that requires two different types of stimuli. One signal is provided by mitogenic signals as anti-CD40, anti-Ig, or LPS, and the other signal is provided by a soluble factor(s) from activated CD4+ T cells. It has also been speculated that the GC responses observed following TI Ag administration are in fact due to the antiidiotypic responses that follow TI Ag responses (25). The antiidiotypic response is a TD response and could therefore readily induce GCs. This possibility is in agreement with the absence of a GC response to DX in athymic mice, which has been discussed previously (26). We cannot formally exclude the possibility that an antiidiotypic response to DX induces GC formation, but the results obtained previously by Wang et al. clearly suggest that there is a GC response to DX (7). However, not all DXs induce GC responses (discussed below) (7). In addition, we have demonstrated previously that the antiidiotypic response following DX immunization has later kinetics than the actual anti-DX response (27, 28). Furthermore, not all TI Ags induce antiidiotypic responses. Rather, there is a certain group of both TI and TD Ags that induce restricted immune responses. For example, phosphorylcholine, which is a TD Ag, also induces an antiidiotypic response (29). Administration of CT together with DX enhanced anti-DX Ab responses to the TI and TD forms of DX in the TNFRI−/− mice. This observation shows that GC formation is not necessary for obtaining an adjuvant effect of CT. In contrast, CT could not enhance the anti-DX Ab response in athymic mice, which indicates that the adjuvant effect of CT for a TI Ag is dependent upon the presence of T cells. The finding of reduced IgG levels in TNFRI−/− mice in response to the TD form of DX is in line with results reported previously. Since the FDCs that are able to provide Ag to activated B cells in the GCs are defective in these mice, it was speculated that the Ag source driving the IgG response is disturbed (30). However, we and others have demonstrated previously that CT can have direct immunomodulatory effects on B cells (17, 18). We showed that a conjugate consisting of the nontoxic B subunits of CT (CTB) and nonimmunogenic DX with low m.w., CTB-DX, could activate B cells of athymic mice to anti-DX Ab production (18). A possible explanation for this apparent contradiction could be that the major means of action for CT is via T cells, unless it is focused directly on the B cells. In the case of CTB-DX, this action would occur via the DX molecule that will bind to the B cells. This explanation is further supported by results obtained with the A1 fragment of CT conjugated to the Ig-binding D region of staphylococcal protein (31), which is a nontoxic modified variant of CT linked to a fusion protein that binds to the Ig molecules on the B cell surface. This variant enables a direct focusing of the CT effect to the B cells via the IgR. We could demonstrate that the A1 fragment of CT conjugated to the Ig-binding D region of staphylococcal protein acts as an adjuvant for both TI and TD DX immunizations (Sverremark et al., manuscript in preparation). The sequence of events occurring in the lymphoid tissues following immunization has been described for many different Ags. In the secondary lymphoid organs, B cells are activated outside the follicles and either become short-lived plasma cells or migrate into the follicle and develop GCs. Here, the B cells undergo the process of affinity maturation and are selected for high-affinity AgRs. This GC reaction has been described mainly for TD Ags and a few TI Ags. It was recently proposed that a major difference between a TD and a TI Ag response was the ability of the Ag-activated B cells to enter the follicles and allow the development of GCs (32). Our previous findings, showing that DX-specific GC formation occurred to the same extent after immunization with both the TI and TD forms of DX (9), diverged from this hypothesis. What seems to differ between these TI and TD Ags is the effectiveness of the GC reaction, since it does not result in the generation of a memory Ab response against the TI Ag. However, Wang and coworkers demonstrated that not all TI Ags can induce GC formation (7). In contrast to the α(1, 2, 3, 4, 5, 6) DX, the B1355S DX (α(1, 2, 3)α(1, 2, 3, 4, 5, 6)) induced vigorous Ab responses without GC development (7). Experiments investigating the nature of the B cell population responding to this type of DX indicated that this population was derived primarily from the B-1 lineage (33); it is possible that this type of B cells do not develop GCs. In correlation with this possibility is another explanation for the lack of immunologic memory to TI Ags. It has been suggested that the B cells responding to TI Ags differ from the B cells that respond to TD Ags (34). We favor another theory, namely that the main reason for the absence of memory responses to TI Ags is due to inefficient T cell help following TI Ag exposure. Appropriate costimulation for the B cells would not be provided during the GC reaction, and no generation of memory B cells would occur. We have experimental evidence supporting this hypothesis (35). Why GCs are formed after TI Ag challenge and their function in the response to these Ags are still open questions. It is possible that the initial steps of a humoral response, including T and B cell collaboration and the formation of GCs, are a distinct event, separated from the actual GC reaction and therefore requiring different signals. The presence of any T cell, rather than one that is Ag-specific, may be enough to initiate the GC response and to provide the right milieu. A GC could be initiated by interactions between Ag-activated B cells and FDCs. Specific T cells are needed to support the formation and persistence of the GC, probably by secreting cytokines. Since the T cells present in GCs formed after TI Ag challenge are not activated by the Ag, proper costimulation for the B cells is not provided and memory development does not occur. However, it was speculated that hypermutation could occur in the absence of classical T cell help, provided that GC formation was accurate (7). This speculation was based on different studies demonstrating the occurrence of point mutations in anti-DX Abs to TI DX (36, 37, 38, 39), which could indicate that these Abs have undergone the process of hypermutation. In conclusion, our findings indicate that TI Ags are dependent upon T cells to develop GCs, whereas Ab production in response to TI Ags occurs independently of T cells. Also, the adjuvant effect of CT observed for both the TI and TD forms of DX is dependent upon the presence of T cells. We thank Prof. Hans Wigzell and Dr. Martin Rottenberg for providing the TNFRI−/− mice and Dr. Christian Krog-Jensen (Carlsbergs Institute, Copenhagen, Denmark) for preparation of the CSA-DX conjugate. ↵1 This work was supported by grants from The Swedish Medical Research Council. ↵3 Abbreviations used in this paper: FDC, follicular dendritic cell; GC, germinal center; TD, thymus dependent; TI, thymus independent; DX, dextran; CT, cholera toxin; TNFRI, TNF receptor I; CSA, chicken serum albumin; bi, biotin; PNA, peanut agglutinin; TR, Texas red; CTB, nontoxic B subunits of CT.
Sverremark, E., and C. Fernandez. 1998. Unresponsiveness following immunization with the TI antigen dextran B512: can it be abrogated? Immunology, In press.